Custom Trade Show Graphics & Displays! What can you do with approximately 200 square feet? When you are an exhibitor at a trade show, the answer depends on the types of trade show graphics and ancillary products you have chosen to bring with you. Whether you are launching a new product, re-introducing a service that used to be a part of your menu or are trying to get the conversation started on a new retail concept, trade shows are the venues where you make contacts, generate the buzz for a product and make sales. At Apex Signs & Graphics, we understand the importance of a hard-hitting trade show display that helps you stand out from the crowd. See what our graphics can do for you. The booth is your space at the trade show. This space defines your brand, drives awareness of your company’s name and should support your advertising efforts. Yet if you look around and see everyone else using the same types of graphics and products, how will this help you to stand out? 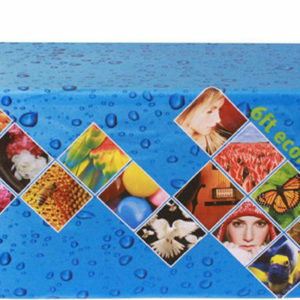 It is here that our wide variety of graphics products shines. Custom banners – When everyone else uses standard banner sizes, go a little wild. Go bigger. Think horizontal in a vertical world. When everyone is gung-ho on bold colors, stick with a monochromatic display. Conversely, highlight your logo colors by keeping a display strictly in these hues. 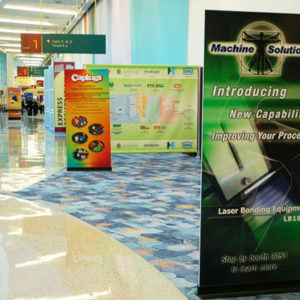 There is no end to the customization opportunities that banners afford any exhibitor. Custom tabletop displays – While banners draw the eye, custom tabletop displays communicate a different message. Your banners promised difference, but can your displays deliver on the promise? Since branding is always front and center for your exhibition, your company’s name and logo must make an appearance. Aside from these suggestions, there is not limitation to your creativity. Work with our seasoned graphic artists to create the types of displays that wow the competition and bring consumers to a halt. Custom printed table throws – Customized printed table throws go underneath your tabletop displays. Their colors should complement the main hues that you chose for the banners and the displays. Do not go overboard with marketing messages – unless you are using the throws on tables where there will be no display on top. In these instances, the throw will communicate the message. We usually recommend printing two sets of table throws that make dealing with this eventuality a snap. 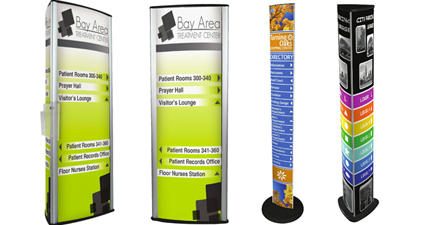 Retractable banner stands with customized banners – What would you like your in-booth banners to say? Do you want to repeat the message of the banners that led up to the booth? Do you want to simply highlight your logo? Easy to set up, these banners are part of your marketing conversation. Make their messages count! 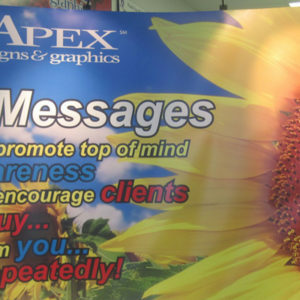 Apex Signs & Graphics has a loyal clientele in and around the Georgia counties of Forsyth, Cherokee, Cobb, Fulton and North Fulton, DeKalb and Gwinnett. Trade show exhibitors from Atlanta, Alpharetta, Milton and other major Georgia cities frequently call on our services before heading for the next local or national show venue. Is it not time that you joined their ranks? 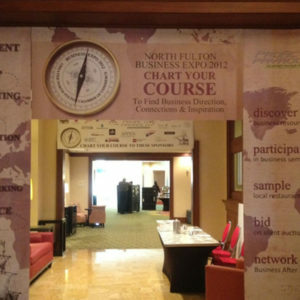 We gladly help you devise your trade show setup from the ground up.